The Geological Society of Japan (JGS) has awarded its prestigious International Prize to IMAS Professor Mike Coffin in recognition of his contributions to geological research, the development of geology in Japan, and the JGS. 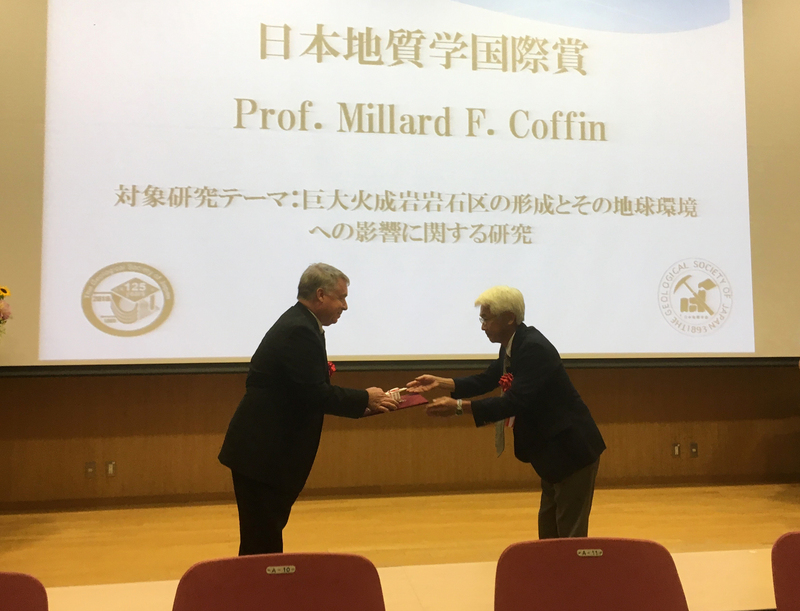 Professor Coffin received the award at the JGS’s annual meeting at Hokkaido University in Sapporo this week (Pictured, right). This year marks the 125th anniversary of the JGS, which awards its International Prize to geologists who have made innovative contributions in geology as well as distinguished achievements in developing geology in Japan by studying the region and/or co-operating with Japanese geologists. Professor Coffin worked at the University of Tokyo’s Atmosphere and Ocean Research Institute (AORI) between 2001 and 2007 as well as the Japan Agency for Marine-Earth Science and Technology (JAMSTEC) in 2002/03. “Professor Millard F. Coffin is one of the leading experts who advocated the basic concept of Large Igneous Provinces (LIPs), and empirically clarified its geological significance,” the Citation says. “He has examined formational processes and mechanisms of LIPs, by analyzing geophysical and geological data in great detail. “It is a great asset for Japanese young geoscientists that they experienced active discussion, and pioneered these research fields with Professor Millard F. Coffin during this tenure at AORI. “The fact that many Japanese researchers are on the list of his achievements demonstrates how his influence on education and research was significant in Japan. The Head of IMAS’s Oceans and Cryosphere Centre, Professor Neil Holbrook, congratulated Professor Coffin on receiving the JGS International Prize. “Mike Coffin is renowned and respected around the world for his contribution to marine geophysics and geology,” Professor Holbrook said. “As well as his work in Japan and Tasmania, where he was IMAS’s inaugural Executive Director, he has also worked at Geoscience Australia and universities in the United States, Norway, France, and the United Kingdom, and undertaken numerous research voyages in the Pacific, Southern, Indian, and Atlantic oceans. “Receiving JGS’s International Prize is important recognition of Professor Coffin’s long and distinguished career at the forefront of marine geophysics,” Professor Holbrook said.